Nicole has a line of polishes available exclusively at Target. I believe there are 12 available, and I picked up three that caught my eye, and they're glitters! I'm lumping in one of the Gossip Girl polishes I picked up a while ago and never posted. I think that collections was also a Target exclusive, and they're on clearance now. Nicole...Spotted! is from the Gossip Girl collection. This is a gorgeous aqua jelly with gold micro-glitter and iridescent hex glitter. This polish is really better suited for layering as it is pretty sheer. Two coats had my nails looking like I needed oxygen. Pictured above is five coats, which actually ends up a pretty sea green, rather than the aqua in the bottle. If you really want to bring out the aqua base, I'd suggest layering over a milky white french polish. The sea green pictured above would be best achieved using a milky natural french polish as a base. The rest of the polishes after the jump! Pitch-Black Glimmer is not what I expected. Looking in the bottle, I thought it would be a black base or black jelly base with the silver micro- and holo glitter. Nope, it's black glitter. Definitely a layering polish, unless you want dalmation nails (which is cool if that's what you want, I won't judge), or you want to apply a thousand layers. Ok, a thousand is an exaggeration, but that's five layers above, so you get the picture. Still, a pretty polish, and I'm already thinking of layering combos. Such a Go-Glitter is also not what I expected. Again, I was thinking a blue jelly base loaded with blue and holo glitter. It is a clear base with the glitter, so also better for a layering polish, but this does have better coverage than PBG (five layers used). I kinda get this sassy Smurfette vibe with all that blue glitter. Normally I eschew blue, but this sapphire-hued one really sucked me in. I've got a couple of deep blue polishes I can't wait to try this over the top of. Oh, and the removal for this polish and the two above was surprisingly easy for glitter (just wash your hands afterward and dry them well on an old towel). No opinion on the last one, as it's my current mani. Sensational Scarlet ended up being what I thought the other two would be. 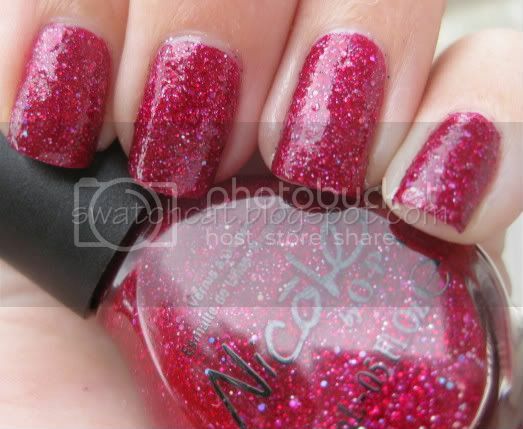 It has a gorgeous magenta base with silver micro-, red and iridescenty-holo hex glitter. The color in the second picture is most accurate, and look at that holo! This is a grown-up glitter. 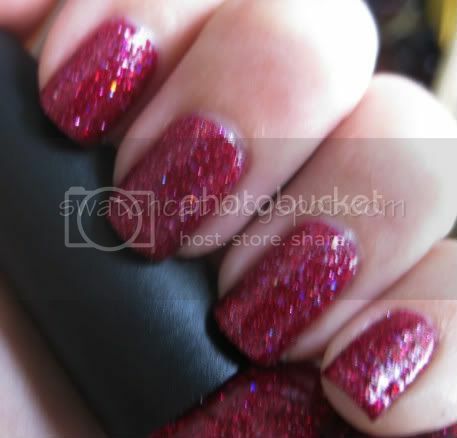 The sparkle is freaking amazing, and I can see this being a great polish for the holidays. Now, this isn't a smooth finish because of the glitter (as you can see in the pictures), so you're going to need to do a couple of thick layers of top coat (the jelly base in the other three allow for those polishes a have smooth finish). I really wish there was a royal violet version of this...actually, there needs to be a whole collection of polishes just like this one. Good greens are hard to come by, sayablack. I haven't had the chance to try them (yet! ), but BB Couture has a ton of green polishes (some with glitter), so you might check those out!